A US citizen detained for more than a month in North Korea has confessed to committing "indelible crimes" against the state, say state media. The official Korean Central News Agency said Merrill Newman had ordered the deaths of North Korean soldiers and civilians in the 1950-53 Korean War. It published what it described as a "statement of apology" by Mr Newman. Mr Newman, now 85, did serve during the Korean War but his family say he is the victim of mistaken identity. Pyongyang's state media has routinely publicised alleged apologies from previous American detainees, which cannot be independently verified, says the BBC's Lucy Williamson in Seoul. Some observers say Mr Newman's alleged confession could allow North Korea to release him without formal legal proceedings. Mr Newman - a retiree from Palo Alto, California - has been held in North Korea since being taken off a plane as he prepared to leave the country on 26 October, following a 10-day tourist visit. 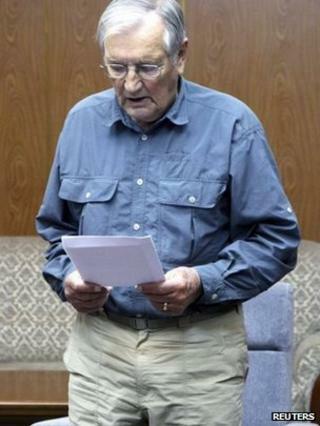 In video released by North Korean authorities, Mr Newman is shown reading his alleged apology, dated 9 November. Image caption "Please forgive me," Mr Newman asks in his four-page statement, titled "Apology"
"During the Korean War, I have been guilty of a long list of indelible crimes against DPRK government and Korean people," the four-page statement reads, referring to North Korea's official name, the Democratic People's Republic of Korea. It claims he was an "adviser of the Kuwol Unit of the UN Korea 6th Partisan Regiment part of the Intelligence Bureau of the Far East Command" - an apparent reference to one of the special operations units acting against the North. Mr Newman apparently confesses to trying to contact surviving soldiers during his trip as a tourist. The statement adds: "Please forgive me." But Mr Newman's family has said there must have been "some dreadful misunderstanding" and have appealed for his release, saying he may need medication. He has previously told Reuters news agency he thought it was possible there had been "a case of mistaken identity". Another US citizen, Kenneth Bae, has been detained since November 2012. US troops backed South Korea in the 1950-53 Korean War, which killed at least two million people.